Boil the chicken breasts and salt to taste. Remove the skin from the breasts. Grind the meat and the almonds. Add sugar and grind all together. 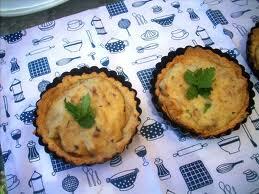 Roll out the dough and cut it to make tiny tarts making them deep in the middle with edges. Place them in small muffin tins with small cupcake liners. Moisten the dough with orange-blossom water by stroking them with a feather. Sprinkle with powdered sugar. Spoon the chicken and nut mixture into the baskets and sprinkle with powdered sugar on top. Bake for about 20 minutes. When done immediately but carefully discard liners so that the tarts do not break. Garnish with a parsley leaf or chives. Nola recommends this and the broth from the chicken breasts particularly for the sick and those who have lost their appetite.